To celebrate the fact it will be 30 years since Manchester club The Haçienda opened its doors, current incumbents of the brand have programmed a very special celebration at Space in Ibiza. Headlining the party on June 9th will be seminal figures from the world’s of house, techno, rave and acid in the form of Kevin Saunderson, Marshall Jefferson, 808 State and original resident, Graeme Park. Back in 1982, Manchester music mogul Tony Wilson was heading up the legendary Factory Records releasing music from the likes of New Order, Joy Division and Happy Mondays. 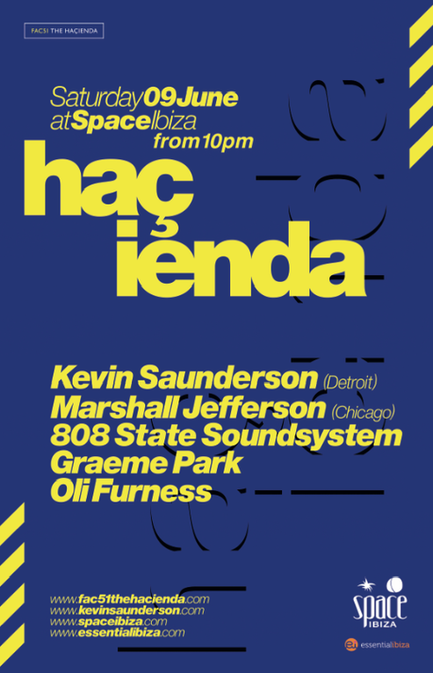 He had a vision to use the profits from said label on a club space; one that gave the city’s flourishing indie dance scene a headquarters, and so The Hacienda was born. The ensuing years made for a short but spellbinding period that saw the birth of acid house, innumerate gigs with acts like Run DMC, Sonic Youth and Gil Scott Heron, resulting in the long-enduring club legend that is still so often talked about in hushed and reverential tones. Someone instrumental to the development of techno over the decades is Kevin Saunderson. A member of the Belleville Three, Sauderson’s legacy is ever secured thanks to his membership of Inner City whose seminal hit, ‘Good Life’, will never grow old. As well as on his own legendary techno label KMS, Saunderson releases on Planet E among many others. Now enjoying a renaissance on labels like Defected with his own new productions and remixes and tour as Inner State, Kevin is as relevant and essential as ever. Few men have been as instrumental in the development of Chicago house music since the 1980s as Marshall Jefferson. Whether crafting his own bona-fide classics like ‘Move Your Body’, or playing the keys on the productions of peers like CeCe Rogers’ ‘Someday’ (with whom he now runs USB Records) or whether touring the world taking his unique house sound and many Traxx releases to fans everywhere, Jefferson is and always will be mentioned whenever the history of house is discussed. 808 State were pioneers of the electronic scene who churned out a number of still classic tracks and albums from their Manchester base. ‘Pacific State’, ‘New Build’, ‘In Yer Face’, ‘Time Bomb’ – take your pick, all combined the new ecstasy rush of the era with techno, rock, house, whistles, bird noises, weird samples and so much more into a sound all their own. Their now infamous performances on trucks, in clubs and all over the world in gas masks only add to the legend that first and foremost is about the music. Graeme Park’s life as a DJ mirrors the evolution of dance music as a whole. Having worked a Nottingham record shop in the early 1980s, he was amongst the first people in the UK to get his hands on the very first house records coming over from Chicago, Detroit and New York. Quickly earning a reputation as one of the finest house DJs around, he was spotted by Hacienda spinner Mike Pickering who asked him to cover for him whilst on holiday in 1988. Parky quickly became one of the biggest names on the emerging dance scene and spent eight years as resident at the club as well as being one of the first British DJs to play places like Australia, South America, the USA, Asia and beyond. With the stunning light and sound, many vast and different rooms of Space and all the club’s own heritage, this is likely to be a night as enduring as The Haçienda itself.